In Scandinavia, Trolls were believed to be giants, and the biggest of them all was Dovregubben (their king in the mountain Dovre). They were shaggy and rough-haired, with trees and moss-like growth on their heads and noses. Their noses were long and they would sometimes stir with them when cooking broth or porridge. Some even had two or three heads (Tolkien admits to the possibility of this in Middle-Earth when he states that “trolls do behave like that, even those with only one head each” in The Hobbit). Their features differed from humans with four fingers and four toes and a tail resembling that of a cow. Legend places them as guardians of bridges and byways, though their help seems arbitrary and dubious. The trolls of Norse mythology lived hundreds of years, only dying if turned to stone by sunlight. Although fearsome, interestingly, Norse trolls did not favour eating man-flesh – their preferred meat of choice was mutton (perhaps Tolkien was remembering this when he called the chapter in which Bilbo encounters Bert, William and Tom Roast Mutton!). As well as being ever-present in German and Scandinavian folklore, trolls are also found in the fairy tales of Finland, Russia and the British Isles – most notably Grendel from the Anglo-Saxon poem Beowulf. Beowulf’s quest is to find and destroy Grendel, who has been attacking the mead-hall of Heorot, killing and eating anyone he finds there. The exact nature of Grendel has long been a source of debate for scholars because his appearance is never directly described in Old English by the original Beowulf poet. Grendel is referred to as a Sceadugenga (“shadow walker” or “night goer”), given that the monster was repeatedly described to be in the shroud of darkness. In the poem Grendel and his mother are described as descendants of the Biblical Cain, the first murderer, and therefore may have something in common with other monsters in the Cain tradition, such as vampires. Seamus Heaney, in his translation of Beowulf, wrote that Grendel was vaguely human in shape, though much larger – his disembodied head, for instance, was so huge that it required four men to transport it. Furthermore, when Grendel’s torn arm is inspected, Heaney describes it as being covered in impenetrable scales and horny growths, much like that of a troll. Tolkien’s translation of Beowulf was much earlier than that of Heaney but, given that they were both working from the same source material, he must also have been aware of the potential troll-like nature of Grendel. 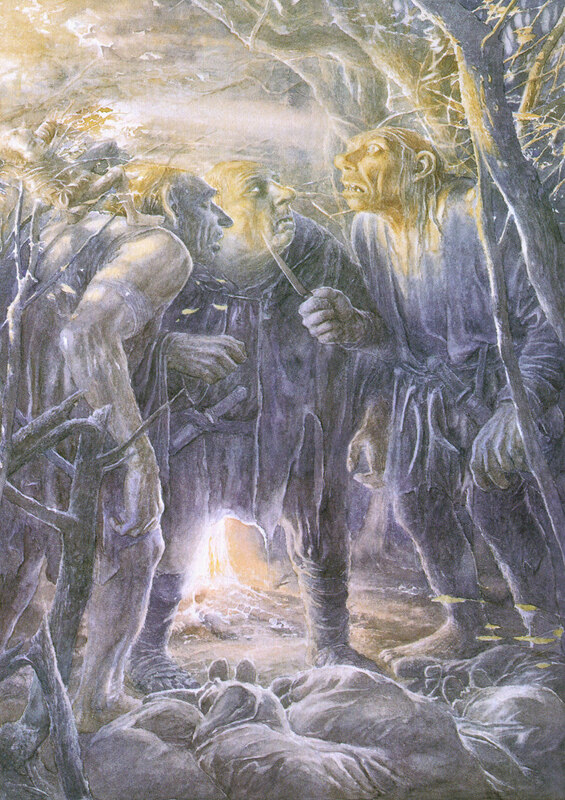 Tolkien’s own trolls, therefore, uniformly had strong bodies and tough skin but dull wits. Indeed, the stupidity of trolls was so great that many could not be taught speech at all, while others learned the barest rudiments of the Black Speech of orcs. But the Dark Lord Sauron made use of them where he could, teaching them what little they could learn and increasing their wits with wickedness. For they made fearsome opponents in battle, most often wielding huge clubs and hammers. Many types of trolls existed in Middle Earth: snow trolls, mountain trolls, hill trolls, cave trolls and others. They were particularly common in the Ettenmoors, the Troll-fells north of Rivendell, where Aragorn’s grandfather met his demise at their hands. Trolls typically lived up in the mountains or in caves and caverns, where they could hide by day from the light of the sun. The exception were the trolls known as Olog-hai, who were bred by Sauron through his foul arts to not only be larger, stronger, swifter and far more cunning than other trolls, but also not to turn to stone in the light of the sun as long as the Dark Lord’s will held sway over them. 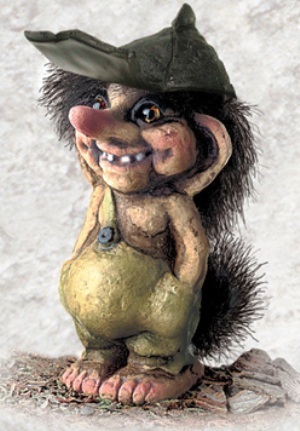 Since Tolkien’s time, trolls have been a staple of fantasy literature, as shown by their numerous portrayals in the Harry Potter, Artemis Fowl and Discworld series. They are also a stock villain in role-playing games such as Dungeons & Dragons, Warhammer and World of Warcraft. In both fantasy role-playing games and novels trolls seem to be similar in appearance and behaviour to Tolkien’s – with a couple of major exceptions. In Memory, Sorrow and Thorn, for example, Tad Williams’ trolls are very different, but arguably just as authentic, as Tolkien’s in both looks and manner. The Qanuc are diminutive, wise and heroic in nature – resembling Inuit tribesmen rather than hulking monsters. This depiction also harks back to Norse mythology, where there seems to have been an element of overlap between the term ‘troll’ and ‘dwarf’, depending on the region of origin of the story. But Scandinavian lore does give a separate name to this smaller troll race, who are sometimes referred to as Huldrefolk (“hidden-folk”). The Huldrefolk are, however, perhaps best thought of as a race apart from the larger, more menacing trolls that inspired Tolkien, terrorised hobbits and no doubt gave nightmares to generations of children from the Viking age to this one. I had snow trolls in my original draft of The Wizard’s Sword, but took them out as they had no bearing on my story.